Thread: Fitch out of stock(ish) and up in price! Any alternatives? 10kg bales have gone from £17.80 to £22 a bale! considering 20kg bales used to be £21 around the beginning of last year I think half the amount now for the same price is ridiculous. That’s me out anyway, I won’t continue to keep buying from this greedy company. Greedy greedy greedy bast#rds. Terrible company. I'm still using up my supplies of cardboard squares for the hamster cage, sand in a jar for his toilet, and for his bed, ripped up kitchen roll. I'll have to buy some more cardboard bedding, if the Fitch prices are still sky high. Yeaa I'm buying the tiny friends farm bedding now, as I can't get carefresh either..
What cardboard squares do you use? Are they absorbant, and odour controlling? My syrian is on cardboard mixed with wood cat litter pellets as I don't think the cardboard is good enough at controlling his odour, he does exclusively use his sand bath as a toilet now though so that's a positive. I'm really annoyed by the whole fitch thing tbh seems ridiculous, I wonder how many customers he'll lose. The cardboard squares I'm using don't have a brand name on them. I got them from a farm shop. I hope they'll have more when I go back! They aren't absorbent, and I'd never want to use them in a toilet area. They're not soft and nice to burrow in, so I think the Fitch is way nicer, but... I think it's an OK alternative. What cages do you guys have? I've opted for the Omlet Eglu Go hutch for my rabbits, after having a number of wooden ones that kept rotting away or breaking! I have a 6 foot indoor cage which the doors are always open to, it's just for all the hay to be contained etc, outside ones have a hutch and run, I also have outdoor pens that are pretty huge. That wasn't for hay, it was for my hamsters bedding. 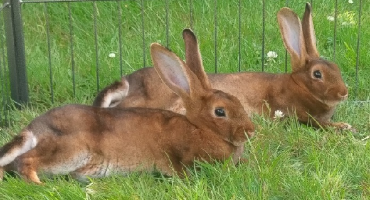 I love the look of your bunnies!